For conspicuous gallantry and intrepidity at the risk of his life above and beyond the call of duty in the afternoon on June 1969 while serving as commander of River Assault Division 152 during combat operations against enemy aggressor forces. 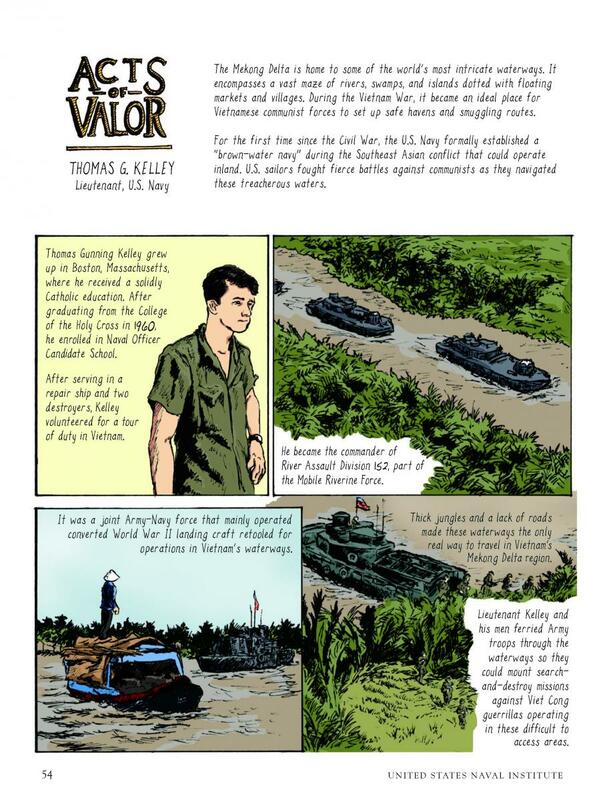 Lieutenant Commander (then Lieutenant) Thomas Kelley was in charge of a column of eight river assault craft which were extracting one company of U.S.Army infantry troops on the east bank of the Ong Muong Canal in Kien Hoa Province, Republic of Vietnam, when one of the armored troop carriers reported a mechanical failure of a loading ramp. 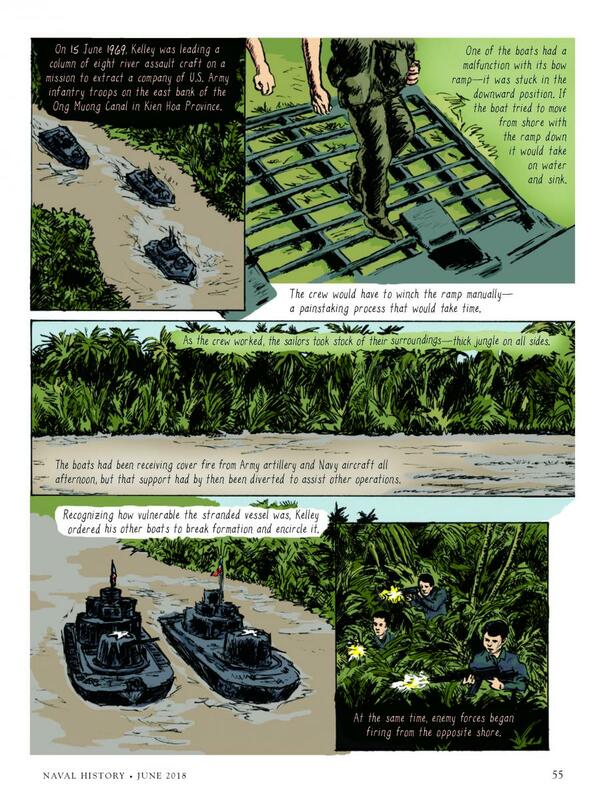 At approximately the same time, Viet Cong forces opened fire from the opposite bank of the canal. 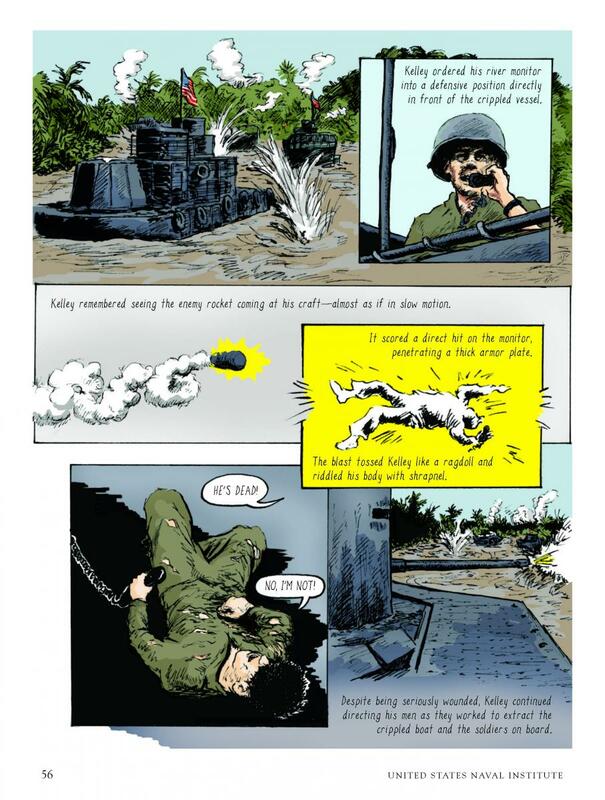 After issuing orders for the crippled troop carrier to raise its ramp manually, and for the remaining boats to form a protective cordon around the disabled craft, Lieutenant Commander Kelley realizing the extreme danger to his column and its inability to clear the ambush site until the crippled unit was repaired, boldly maneuvered the monitor in which he was embarked to the exposed side of the protective cordon in direct line with the enemy’s fire, and ordered the monitor to commence firing. Suddenly, an enemy rockets cored a direct hit on the coxswain’s flat, the shell penetrating the thick armor plate, and the explosion spraying shrapnel in all directions. Sustaining serious head wounds from the blast, which hurled him to the deck of the monitor, Lieutenant Commander Kelley disregarded his severe injuries and attempted to continue directing the other boats. Although unable to move from the deck or to speak clearly into the radio, he succeeded in relaying his commands through one of his men until the enemy attack was silenced and the boats were able to move to an area of safety. 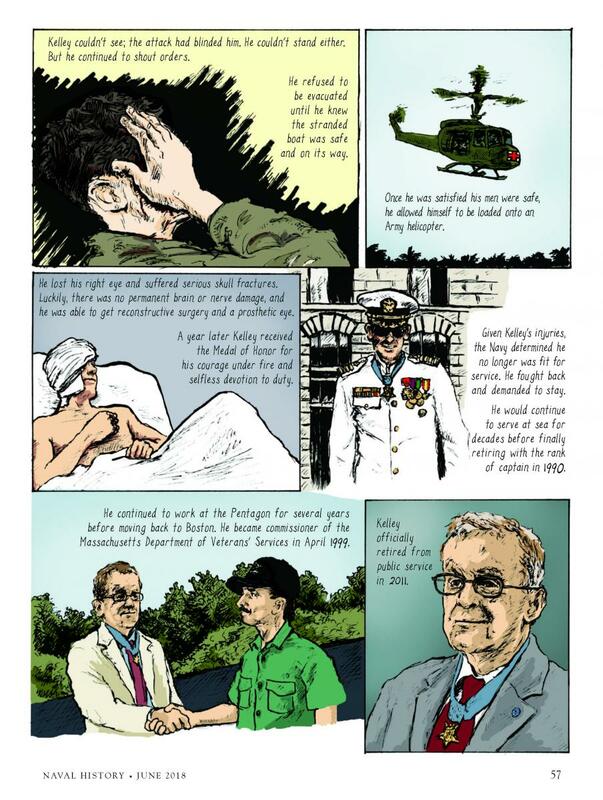 Lieutenant Commander Kelley’s brilliant leadership, bold initiative, and resolute determination served to inspire his men and provide the impetus needed to carry out the mission after he was medically evacuated by helicopter. His extraordinary courage under fire, and his selfless devotion to duty sustain and enhance the finest traditions of the United States Naval Service. MOH Recipient Jack Jacobs (9th I.D. 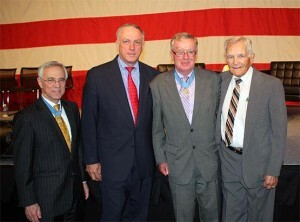 ), Ed Frank, MOH Recipient Tom Kelley and Richard “Doc” Nelson. Tom Kelley credits Richard “Doc” Nelson with saving his life on June 15, 1969. He invited Richard to be his honored guest during the celebration. Tom was very pleased to hear that over $300,000.00 was received for the Massachusetts Soldiers Legacy Fund as a result of the event. The funding assists the spouses and children of Massachusetts military personnel who gave the “Ultimate Sacrifice” in Iraq and Afghanistan. Let’s all support Tom & Joan in this venture. How can we go wrong by supporting one of our River Rat heroes who is donating 100% of the proceeds to our fellow veterans?! It’s definitely a win-win situation. Also be sure to write a “Review” for the book at Amazon once you read it.